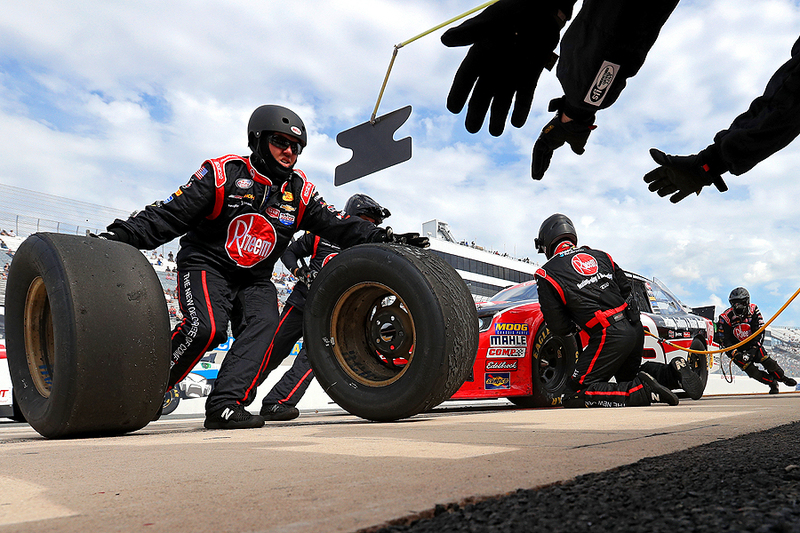 "Ty Dillon, driver of the #3 Rheem Chevrolet, comes in for a pit stop during the NASCAR XFINITY Series Ollie's Bargain Outlet 200 at Dover International Speedway on May 14, 2016 in Dover, Delaware." Each and every venue has it's gems - yet it's finding them and knowing how to use them that makes it a challenge. For motorsports, some tracks have different shooting positions that make routine documentation a bit more of a calculated risk. As an example, at most race tracks, pit stop walls are solid concrete. And going over the wall with any part of your body and camera as a photographer is strictly prohibited. However, at Dover International Speedway, the pit road wall is more of a guard rail with an opening below. This allows photographers to wedge their camera underneath the opening and spray frames blindly as cars come speeding in for tire changes. Maybe it's because in all my years at Dover I was playing it safe when I covered pit stops. Whatever the reason being, I'm glad I went for something different this time around. There is nothing better than getting multiple layers of action in one sports image.